Patterson was at a cousin's birthday party at a gymnastics club in 1994 when a coach at the gym saw her and asked her mother if she was taking lessons. When her mother said no the coach was amazed at her natural talent. Carly then began taking lessons. Carly loved her lessons and kept up doing them. In 2000, Patterson participated in the Top Gym Tournament in Belgium; she won the silver medal in the all-around and the bronze medal for balance beam, which she has said is her favorite event. 2001 American Team Cup, she first performed her signature beam dismount, an Arabian double front. At the 2001 Goodwill Games in Brisbane, Australia, she was ranked second in the all-around before the final rotation. She was suffering from a stomach illness, however, and she missed three landings on the floor exercise and finished seventh overall. Nevertheless, her balance beam routine was particularly spectacular, featuring what would become her signature double arabian dismount (later to be named "the Patterson"). Patterson was named the U.S. Junior National All-Around champion in 2002. She had previously received fourth place in 2000 and third place in 2001. 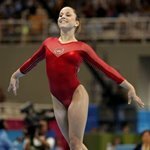 By this time, she was largely considered the future of American gymnasts and a viable candidate for the 2004 Olympic All-Around title. From 2002 onward, she would continue to win nearly every All-Around event she entered. 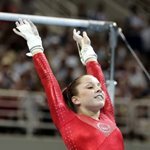 She was forced to sit out the 2003 U.S. National Championships because of a broken elbow (a big disappointment for Patterson, as this was to be her first senior nationals). At the 2003 World Gymnastics Championships in Anaheim, California, she earned the all-around silver medal —the first time an American woman had won an all-around medal at that competition since 1994. She also helped her team to earn the team gold medal. It appeared Patterson would once again fight it out with Russia's Svetlana Khorkina in Athens.